Option B) Contact Us > Receive a link to your design, and a customer service rep will reply to your questions. Can I get a link to my saved artwork? Then you will receive an auto email response containing a link to your design. You can share or continue to edit from the link. If you have included other questions to the message, our customer service reps will response within the same or next business day. I cannot find my saved artwork. How do I proceed? Kindly let us know the design name you have saved, as well as the date. Our team will be able to retrieve it from database. 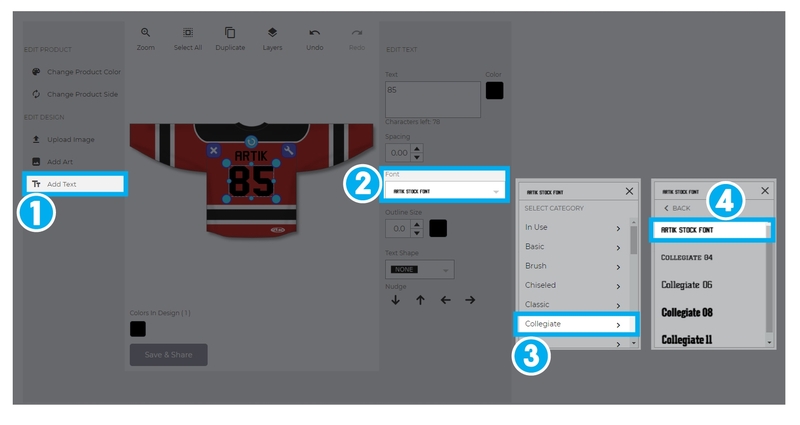 Where can I add names or numbers for my sport jerseys?